It’s always risky to narrow down a championship chasing field when most teams still have five or six matches remaining and a lot can change, but it’s certainly starting to look like the battle for the 2018/19 VMSL Premier crown is down to a four horse race. Those contenders look to be current leaders West Van FC, second placed Croatia SC, CCB LFC United, who have a game in hand, and defending champs BCT Rovers Tigers United, who have two such games to catch up. Week 17 saw three of those four come up with important wins, as some others started to fade down the stretch, and it’s a battle that’s set to intensify over the new few weeks. 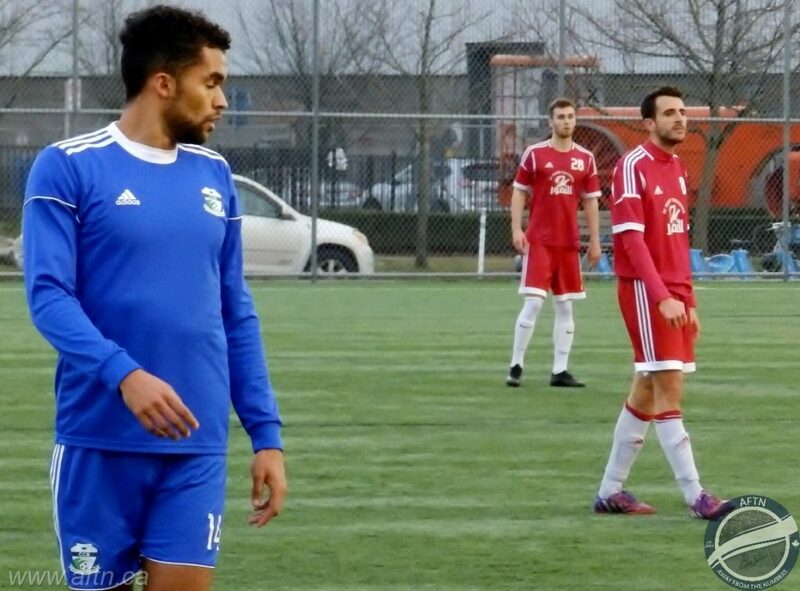 Last weekend’s action got underway at Burnaby Lake on Friday night as Croatia SC temporarily took over the top spot following a 3-1 win over Richmond FC Hibernian. And it was the visitors who shocked Croatia, taking a 28th minute lead through Ryan Rogers, before David Malamura got back to his goalscoring ways with one either side of half time to put the home side in the driving seat. Kyle Kemp hit a third for Croatia in the 65th to secure the three points. With the recent addition of former SFU player Colin Jacques, who had been playing over in the VISL after his return from the actual Croatia in September, a big push for the title could now be on the cards. BCT Rovers Tigers United’s hopes of back to back championships were dealt a blow by the team they took the Premier crown from at Newton. Coquitlam Metro Ford Wolves’ form has been very up and down this season but they came up with a big 2-1 win on Friday night. Missing the suspended Nick Soolsma, Rovers Tigers had the best of the early going, with a couple of great chances to open the scoring in the first five minutes being squandered. Missed opportunities they would come to rue when Juan Sanchez fired a free kick in off the bar in the 17th minute to give Metro Ford the lead. The visitors doubled their lead six minutes later when Andrew Peat scored. Ryan Dhillon pulled one back with a finish at the near post a minute before half time, but despite a barrage of second half pressure, Rovers Tigers couldn’t find another goal to take even a point from this one, leaving them fifth in the standings, six points off first but with two games in hand. Newton also played host to the final Friday match and it was a momentous occasion for Campo Atletico who gained their first point of the season following a battling 1-1 draw with Pegasus SFC. The Horsemen will be wondering how they didn’t come away from this one with the win after dominating throughout, especially as Campo only turned up for the match with 11 players (although a sub did arrive as the game was underway). Pegasus’ pressure finally paid off just before half time when Chetan Jhooty’s low shot was fumbled by the Campo keeper. The visitor’s had some less than stellar goalkeeping of their own to thank for their equaliser after a poor clearance from an out of position Pegasus goalie fell into the path of Isaac Mendoza Maldonado, who fired into an empty net from 35 yards out for his first goal of the season, and Campo’s first point. That draw still sees Campo cast well adrift at the bottom of the standings. They’re eight points behind the two teams above them, with five matches remaining, and although they certainly have shown some signs of improvement in recent weeks, the great escape certainly doesn’t feel like it could be on unless that can find a couple of goalscorers. That said though, they do still have to play against both of those sides immediately above them, so never say never. The match of the weekend took place at Vancouver’s Trillium Park on Saturday afternoon, as the two teams tied for third place, Rino’s Tigers and CCB LFC United, battled it out. For me, these are the two sides that have consistently played the best football in the VMSL this season. The talent both teams boast is impressive, and you have to feel a number of those on the pitch in this one will be seeing some action in the CPL sooner rather than later. We were hoping for a fast flowing match, with some great skill and goals, and we got it, albeit a far more one-sided affair than we were expecting. CCB were dominant in this one, running out fairly comfortable 3-0 winners, although Rino’s simply didn’t have their shooting boots on to make the game of it that their chances deserved. Former Whitecap Victor Blasco was the dangerman and it was his work up the left wing that saw the Surrey side take an 18th minute lead when he played the ball across goal for his former WFC2 teammate, Caleb Clarke (pictured above), to easily tuck away right in front of goal. That was how it stayed until the second half, and with Rino’s pushing and CCB happy to sit back and soak up the pressure, it was a quick CCB counter that nearly saw them kill the game off. Blasco got onto a long, bouncing ball forward, and while Rino’s wanted a foul for a coming together with centre back Elie Gindo, the Spaniard wasn’t waiting around to see if there was a whistle, powering towards goal, but a last ditch block saved the day. The Spanish winger was to get his name on the scoresheet though when he fired home a loose ball in the box through a crowd of bodies, before Daniel Morello hit a long range laser to make it 3-0 near the end. You can see all the goals, and some other highlights, in our video below. It was a massive win for CCB. One which sees them take sole possession of third place, two points off the leaders and with a game in hand. And although they’re still in the mix in fourth, five points off the lead, you have to feel that the defeat could mark the end of Rino’s chase for the title for another year, although their final three matches are against Rovers Tigers, West Van, and Croatia. They may need to win out, but they certainly have the talent at their disposal to do that. Those leaders continue to be West Van FC, and with no room for error, the Amblesiders did what they needed to do on Saturday, seeing off the visiting Guildford FC 3-0. Thomas Arnott set the leaders on their way in the 18th minute, with Paul Kelly adding a second on the stroke of half time. Colin Phillips added a third seven minutes after the restart to secure the victory and keep West Van out on top by the narrowest of margins. 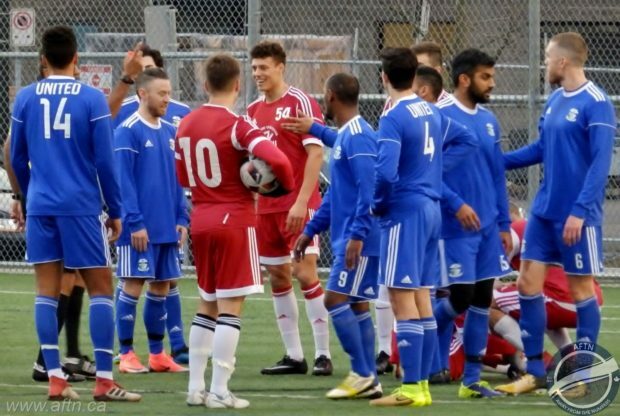 North Vancouver was the setting for the final match of the weekend, with Club Inter EDC Burnaby heading over the Ironworkers to secure a 2-0 victory over NVFC Norvan thanks to goals from Liam Miller and Marco Visintin. 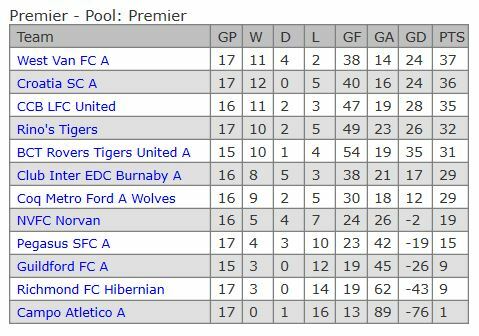 This week’s action gets underway tonight (Wednesday) as BCT Rovers Tigers United head to Vancouver to take on Club Inter EDC Burnaby at Van Tech. Kick off is 9.10pm, with the Surrey side not able to afford any more slip ups. The match of the week should be in Coquitlam on Friday night as the old rivals of Metro Ford and West Van battle once again at Coquitlam Town Centre. Kick off for that one is 8pm.